MotorSpeak: Start Your Honda Engines! On yet another erstwhile afternoon of channel surfing I came across live coverage of IndyCar racing. It's basically a hosed down version of F1 where all the teams use the same chassis and engines and people called Will Power drive (I'm not making that up). Anyway with the pre-race build up well under way for the Honda Indy 200 at Mid-Ohio it came to the point where some balding account manger from an appliance corporation gets to say the "start your engines" bit. 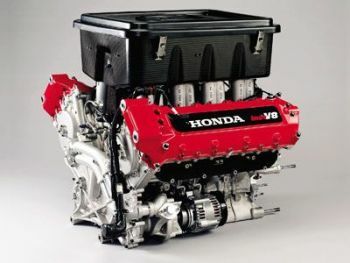 But then something felt wrong because what I heard him actually say was "Gentlemen, start your Honda engines". I'm not kidding. Even in the most capitalist country on the planet one would assume that the original phrase was, and it sounds silly now, a bit sacrosanct. Even when you have no interest in motorsport anyone can still recognise the famous phrase but apparently now it can be bought. At first I was a little saddened but then I remembered that any affection I had for this series dissipated a long time ago after I watched the cars lap an oval for the 200th time in one afternoon. The issue of sponsorship and what can or can't be bought is nothing new especially in the U.S. where every race, track, driver, car, broadcaster and even the celebratory drink has a sponsor. I just hope it doesn't find it's way to F1 or Moto GP. Of course those series are already heavily sponsored, its their lifeblood after all, but some things I hope are sacrosanct. I'll never watch the Shell Powered Monaco Grand Prix hosted by Cheesits. Duuuude. Motorspeak looks so sweet right about now. I'm seriously digging the makeover.